This article is a short summary of Mario Party DS. 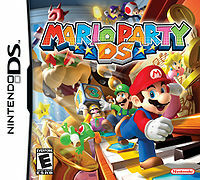 Mario Party DS (Japanese: マリオパーティＤＳ Mario Party DS) is the eleventh main installment in the Mario Party series. It is the second Mario Party game to be released for a portable console, the first being Mario Party Advance. An all new Mario Party... in the palm of your hand! Play on four Nintendo DS systems with only ONE Game Card! Draw back your bow and fire! Mario and his friends get tiny for this party! It's Mario Party in the palm of your hand! When Mario and his friends are shrunk down for Mario Party DS, harmless locations take on menacing proportions in five game boards, such as Wiggler’s Garden and Toadette’s Music Room. The party boards and minigames are crazier than ever in a new title that shrinks down the whole Mario crew for whimsical party play. With 70+ minigames and five themed game boards, Mario Party DS packs all the goods for portable play. And it’s brought to life with fun surprises players can see only on Nintendo DS, such as touch control, microphone control and dual-screen challenges. Users can play as one of eight characters: Mario®, Luigi, Yoshi™, Peach, Daisy, Toad, Wario™ and Waluigi. They’re all ready to foil Bowser’s latest scheme. He seeks five powerful crystals and shrinks down the crew so they can’t stop him. But each of the tiny heroes wants to be the one and only Superstar that brings down Bowser. In the Mario Party series, after everyone takes a turn moving on the game board, the action shifts to a minigame. In Mario Party DS, the minigames are crazier than ever, because everyday objects are a huge threat to the minimized crew. More than 70 minigames use the Nintendo DS Touch Screen, the microphone and standard buttons in a surprising combination of ways. Players will fling massive hamburgers with the stylus, drag huge leaves out of the way in a forest race and literally blow down a gargantuan Whomp. Characters: Play as eight classic characters, including Mario, Luigi, Wario, Waluigi, Yoshi, Daisy, Peach and Toad. The tiny characters will encounter many “gigantic” friends and foes from the Mario universe, including Bowser, Toadette, Donkey Kong® and Hammer Bro. Special powers/weapons/moves/features: Mario Party DS brings back a play dynamic from previous games: putting traps on board spaces. Players can obtain Hexes, such as the Coin Swap Hex, then stick them on board spaces in the hope that other players stop on them. Mario and his friends have been shrunk down by Bowser, and they're ready to foil his latest scheme! Play as one of eight characters in four game modes, five themed game boards, and over 70 minigames. Take turns moving around the board to reach first place, or get immersed in constant minigame action! One night, five glowing objects fall out of the sky in the Mushroom Kingdom, one of them landing near Mario. Mario and his friends are discussing the object the next day when Kamek flies by, dropping invitations. The invitations are from Bowser, who is throwing a feast at his castle to apologize for his evil actions in the past. However, when the group arrive at the castle, it turns out to be a trap. Bowser then uses his new Minimizer to shrink them all, and has Kamek throw them out of the castle after he takes the object Mario found, revealed to be a Sky Crystal. Mario and friends decide to make their way back to Bowser's Castle and settle the score. The gameplay of Mario Party DS is similar to past entries in the Mario Party series. The game now has two types of items: Normal items that can be used on themselves, and a new type of item called Hexes, which allow players to place a trap on the board. The majority of the mini-games often utilize the system's touch screen or microphone. In Puzzle Mode, there are six mini-games that originated from previous Mario Party games; with five including Mario's Puzzle Party (Mario Party 3), Bob-omb Breakers (Mario Party 4), Piece Out (Mario Party 5), Block Star (Mario Party 6), and Stick and Spin (Mario Party 7), and a new puzzle mini-game called Triangle Twisters, which can be unlocked after beating the final boss of the game. A major focus in the game is the inclusion of multiplayer gaming - which enables players with Nintendo DS units to wirelessly play Party Mode, and Mini-Game Mode for four players, and Puzzle Mode for two players with a single game card, or multiple game cards. Mario Party DS Wii U (Virtual Console) 2016 A direct port of the game released as a digital download on the Wii U Nintendo eShop, with added Virtual Console emulator features. For the South Korean release of the game, two of the minigames, "Chips and Dips" and "Shuffleboard Showdown", were removed. This page was last edited on 8 October 2016, at 01:19.